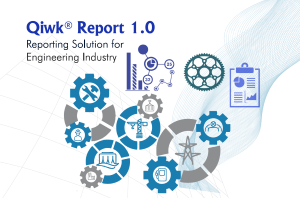 Qiwk® Reports is an easy-to-use Self Service Reporting and Analytics application which is tightly integrated with PLM systems. It enables enterprises to transform PLM data into actionable knowledge which can be used to address business questions. It provides exceptional visibility to enterprise business processes that are based on PLM data. Multithreaded ETL layer to export, transform and load data from PLM system to a staging database in near real time. PLM Data warehouse supports integration with MicroStrategy, Business Objects, Tableau, QlikView and other major business intelligence tools. Report Designer to design reports on an ad-hoc basis by the Business Users. Rich and interactive User Interface and data export in excel pdf and various other formats. Utilize the staging area to interface data to other enterprise applications. Configurable role-based access privileges to core features and functionality. Dashboard containing charts and graphs to give a bird’s eye view of information. Report scheduling, email notifications, sorting and configurable filter criteria. Over 25 out of the box report templates provided. Qiwk reports is a platform agnostic reporting solution. Currently the tool is offered for PTC’s Windchill PLM solution. Available on request for other PLM solutions including - Aras, Siemens Teamcenter, Dassault Enovia PLM and Oracle Agile PLM. Enterprise Ready: Tiered secure services oriented for scalability and security with connection to the Windchill PLM Server instance.